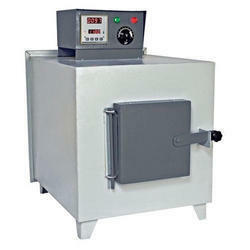 Our range of Muffle Furnace are best suitable for the laboratories and in various experiments. Muffle furnace is light weight with ceramic fiber wool insulation (instead of brick insulation). 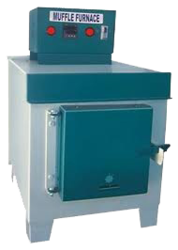 Some of the features of muffle furnace are as follows:The outer casing is made of double walled thick PCRC sheet, reattached with thick perforated sheet on the bottom portion, painted with attractive stove enamel/powder coated. Its heating elements are made of KANTHAIL wire and backed by high temperature ceramic wool insulation, which avoid loss of energy. Temperature control unit consists of digital temp. controller, fitted in front of furnace with two pilot lamps. The apparatus is complete with digital temp. Rectangular shape wounded muffle baked at high temperature is fitted inside the chamber. 1.The outer casing is made of double walled thick PCRC sheet, reattached with thick perforated sheet on the bottom portion, painted with attractive stove enamel/powder coated. 2. Its heating elements are made of KANTHAL wire and backed by high temperature ceramic wool insulation, which avoid loss of energy.3. Temperature control unit consists of digital temp. controller, fitted in front of furnace with two pilot lamps.4. The apparatus is complete with digital temp. controller, silver thermal fuse, main lead with power plug.5. Rectangular shape wounded muffle baked at high temperature is fitted inside the chamber.